Forward-thinking designs, top quality American steer hide leather, a proven Ralide tree, and lightweight Cordura firmly elevate this saddle into a class by itself. Made for Tennessee walkers, the Fabtron Gaited Trail Saddle sports a higher gullet and bar angle to allow that extra movement in the neck and shoulder area. The 7/8 position rigging is a favorite of all-around riders, allowing close contact between the horse and the rider. From the fleece-lined skirt to the leather padded stirrups, Fabtron's saddle makers got every detail right. I bought my first Fabtron Gaited Trail Saddle in 2014. I'm still using it and it fits my TWH mare quite well.I really wanted a "real" leather saddle when I bought my Gelding in Sept 2017. The saddle I bought does not fit him well and it's much heavier. I should have just gone with my gut and bought the 2nd Fabtron right away, instead of wasting time and money on the leather saddle. Lesson learned.this is a nice looking synthetic saddle and it's holding up well.. Both of mine are black. I think the black looks better than the brown.Comfortable for both my horses and me. This saddle is the only tree that fits my horse, and I've tried many, so that was the deciding factor in my purchase. For the price, it's not bad. The quality is not the greatest, but it is durable enough. The seat is also not the most comfortable and is a bit on the wide side, but as long as my horse is comfy I'm happy. One other thing is when I received the saddle, the fender was underneath the strap that's connected to the front rigging dee (see photo) . It took some maneuvering to get the stirrups out from under that strap. Overall I'd purchase this again, just because the fit is great. I purchased this saddle for my very hard to fit TWH mare. This has been the only saddle I've owned in 10 years that has fit her perfectly! It's light weight and comfortable for both me and my horse. I would highly recommend Fabtron saddles to anyone interested in a light weight, durable saddle that is of great quality for the price! I have a Tennessee Walker that is difficult to fit. I've always ridden saddleseat. 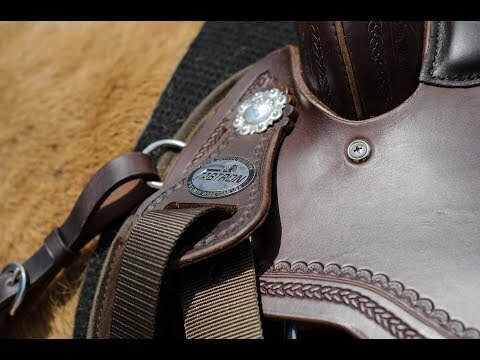 I wanted to get a western saddle for some small shows and trail riding. I talked to the factory about these saddles and they were very helpful. I had actually purchased another western saddle that did not fit my horse very well and was very uncomfortable to me.My horse is wide and high at the withers/shoulders. This saddle fits him perfectly. There is no pinching at all in the shoulder and wither areas. He moves very freely out of his shoulders - even moreso than when I use my dressage saddle. I love this saddle! I did change the stirrups for a nominal cost. But, I find most western saddles don't come with the stirrups that you want, so I still give the saddle an A+ rating. The customer service at Fabtron is excellent as well! Great saddle for horse and rider. Perfect fit. After trying many saddles on my missouri fox trotter, I decided to take a chance on a Fabtron saddle. I talked to the company and it seemed like it would fit my horse. The day it arrived, I was in the saddle. Very comfortable for the horse and myself. The first ride was 5 miles, and everything seemed to fit great. The next 3 rides were 10 miles and still everything was great. It appears she gaits effortlessly in this saddle. It was comfortable to ride in right off the get go. No breaking in for my horse or myself. I would recommend this saddle for anyone having a hard time fitting their gaited horse or just if you want an extra saddle that is light weight and very comfortable and affordable. I was dissappointed to find the color (black) was spray painted on the leather and was rather uneven in tone. Some areas were not even covered. This saddle is lighter than an identical older model and the craftsmanship is lacking. Doesn't fit as well either. I love this saddle. It fits all of my gaited horses no matter their shape. It allows for free movement in the shoulders and it helps them gait beautifully. Tried this saddle thanks to a friend. It felt comfortable and is expected to fit my TWH. How long is this saddle? And does it lift away from the shoulders? BEST ANSWER: Raised front with 7" gullet width, gaited tree w/ full quarter horse bars. Can the fenders be changed to youth size? BEST ANSWER: Fabtron is located in Maryville, TN (phone 800-654-231). Would talk with the company. Have been most helpful when I have called; I trail ride. Unfortunately this saddle does not have customization options. BEST ANSWER: Unfortunately, we cannot determine whether a saddle will fit your horse online. The saddle features a raised Front with 7" gullet width.